Above Graphic: NetBase’s research on sentiment and share of voice in social channels finds that, while there’s more share of voice in traditional hotel brands, people prefer 6-year-old peer-to-peer service Airbnb over 88-year old traditional hotel brands like Hilton. Last week’s NYT article on the Sharing Economy focused on Airbnb, and ties nicely to our continued research on this topic. A few weeks ago, we compared collaborative economy startup Airbnb to traditional travel booking sites, and Airbnb out-shined the traditional market. NetBase (a client) provided me a slice of their data from the Brand Passion Index to show how consumers who use social media feel about Collaborative Economy startups Airbnb and OneFineStay (high-end p2p travel experiences) compared to traditional hotel brands. The size of the circle reflects the quantity of discussions in the social sphere. The location determines the sentiment. Remember, this isn’t my study, nor did I cut the data. It was provided to me by NetBase. If you would like to get more information about their study, please contact CMO, Lisa Joy Rosner. Poster Child, Airbnb, “Loved” by the Crowd. The runaway winner on brand passion is Airbnb, which falls into the “Love” category and has about half the diameter of either Four Seasons or Hyatt. This company allows the crowd to act like a hotel as guests stay at local neighborhoods, homes, and rooms as a friend would. This personalized, local experience is difficult to replicate at larger hotels which must cater to efficiency and consistency of experience. Boutique Startup OneFineStay Has Small Footprint, But Is Also “Loved”. Collaborative Economy startup, OneFineStay, which enables hosts to rent out their multi-million dollar homes to those who want to live a life of luxury, has a small-brand footprint in terms of quantity in share of voice, but has strong positive brand sentiment in the “Love” category. Four Seasons and Hyatt Have Healthy Market Positions. Both Four Seasons and Hyatt show a moderate share of voice, but are in the “Love” quadrant, although they are closer to the neutral spot. They must continue to grow their positive online sentiment or they risk moving towards the center axis or crossing into the negative sentiment quadrants. Marriott And Sheraton Grouped in “Like”. Both brands indicate healthy word of mouth. 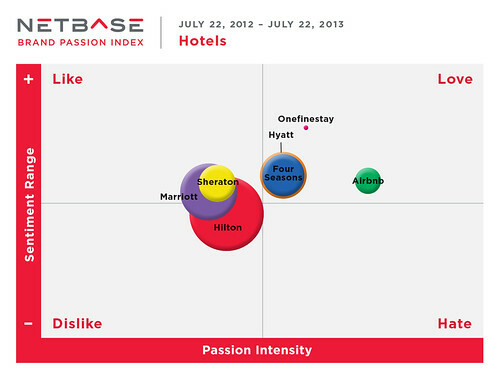 Both sit in “Like” category, although about one-third of Marriot’s share of voice is in the “Dislike” category. They must continue to bolster guest experience and encourage customers to talk about their positive experiences or risk continued negative or nearly neutral brand sentiment. Hilton Holds Greatest Share of Voice, But Most Negative Sentiment. Hilton has the greatest share of voice online, but over half is ”Dislike” content, not positive sentiment. Hilton must evaluate its broader customer experience strategy and double down on social marketing to populate positive customer sentiment. In this brand set, it’s the only one with a large negative sentiment. Wonder how fast Airbnb is growing? Here are some key quotes with stats: “Tonight we have 140,000 people around the world staying in Airbnb rooms. Hilton has around 600,000 rooms. We will get up to 200,000 people per night by peak this summer.” Airbnb has 23,000 rooms and homes listed in New York City alone, and another 24,000 in Paris. Worldwide, “we have listings in 34,000 cities and 192 countries,” (NYT, July 2013). Also, “On New Year’s Eve alone, 141,000 people worldwide stayed at an Airbnb. In single-occupancy terms, that’s almost 50% more than can fit in all the rooms in all the hotels on the Las Vegas Strip. To be sure, those figures still pale next to the entire U.S. hotel industry, which according to research firm STR, sold 1 billion nights alone between January and November 2012.” Forbes, Jan 2013. Read all the stats I’m curating on the Collaborative Economy Stats Page of this aggregation page. I want to add that I visited Airbnb’s brand new headquarters in San Francisco last week. It’s going to be quite the hub! Rather than fight the collaborative economy, hotel brands should instead study the new business models and enable this changing behavior within their own customer base. We’ve identified new business opportunities for hotels, including partnering with these startups or enabling their own marketplace of guest homes for rent, backed by their own brand, supply chain, and even supplying trusted customers from their own loyalty programs. Read the following post: The Six Scenarios for Hotels to Address the Collaborative Economy. Update: I’m hosting a conversation about this post on Facebook.